Fabricated Twitter messages claiming activist DeRay Mckesson was plotting a "summer of chaos" with Attorney General Loretta Lynch resurfaced after the Dallas police shootings. 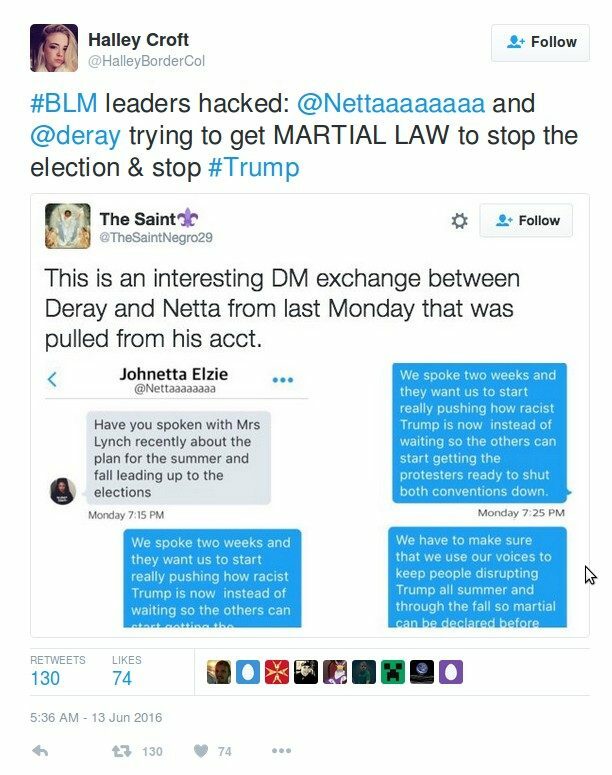 Hacked Twitter DMs reveal that activist DeRay Mckesson planned a "summer of chaos" involving protests and riots with Attorney General Loretta Lynch. On Facebook I got a post today from a friend saying the Obama administration is starting a summer of chaos and will call martial law before the elections. 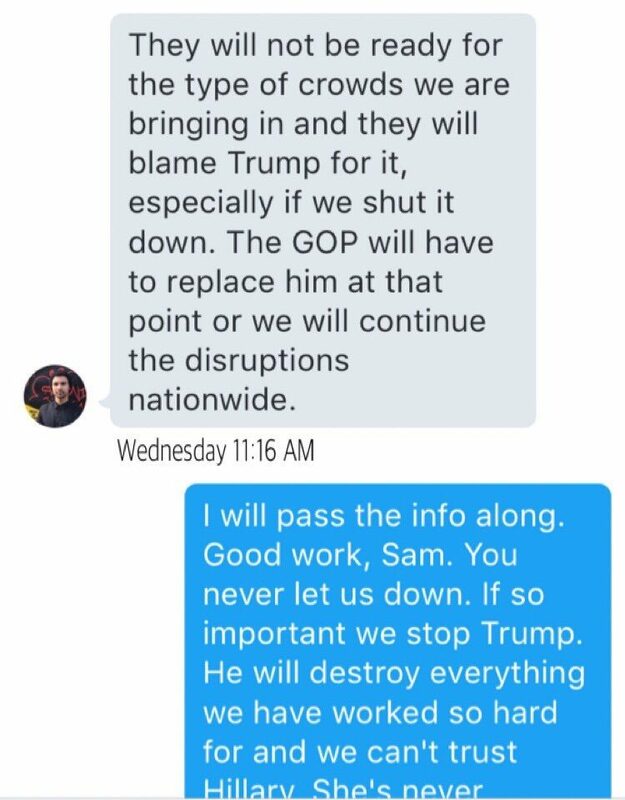 There are supposedly leaked e-mail, tweets, etc. from Black Lives matter. What happened in Dallas is the beginning. The site given is from tipsforsurvivalists.com. I google the topic and a lot of far right blogs are pushing this as well. 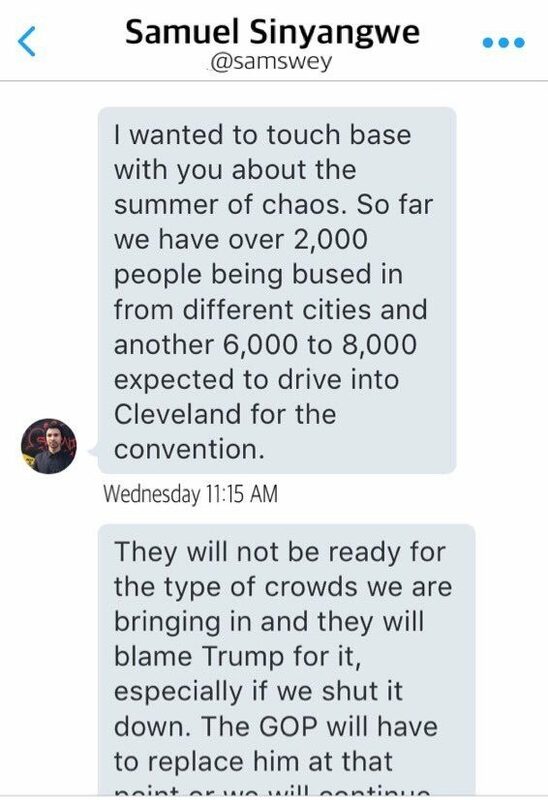 The group plans to bring more than 10,000 people to create chaos July 18-21 in both Philadelphia and Cleveland, according to the leaked PMs. To top it all off, the “Summer of Chaos” plan goes all the way up to the Obama Administration and even involves U.S. Attorney General Loretta Lynch, according to leaked messages. The transcript and messages contained an implausible level of detail for ongoing discussions (of which those involved would already be apprised), involving hard-to-swallow exposition ensuring those who read them weren’t left wondering who the players involved or desired outcome of the plotting might be. Had Mckesson and his collaborators truly been engaged in complex, high-level planning with the assistance of the Obama administration, the messages would likely involve broad terms used among individuals already immersed in the plots. Referencing Lynch by name was unnecessary save to create the connection desired, and presumably a conspiracy of that level would occur on a far more secure channel of communication. As reported by Alice Speri for The Intercept, June 23, 2016, local police and federal agents from the FBI, DHS, and Secret Service are knocking on the doors of activists and community organizers in Cleveland asking about their plans for the Republican National Convention in July. On June 29, 2016, Deray McKesson sort of confirmed the plan when he went public with warnings about “possible” protests at the DNC and RNC, as reported by USA Today. In fact, a recent survey showed that as many as 67% of Democrats want Obama for a third term. After he regained control of his Twitter account, he explained that the attackers managed to do the deed by convincing Verizon to reset his SIM. That way, the hijacker or hijackers managed to set it up so they could intercept text messages intended for Mckesson and thereby bypass the 2FA that otherwise should have kept his account secure. There was social engineering involved: the hacker(s) called Verizon’s billing department and impersonated him. Then, they redirected his phone service to their own phone, so that calls and texts that should have gone to Mckesson’s number went instead to theirs. Then, they used Twitter’s password reset feature, which relies on authorization codes sent via SMS to a phone. In other words, they didn’t need Mckesson’s password: all they needed was the last four digits of his taxpayer ID and his name to lock him out of his account. Within days of the hack, the purported screenshots began circulating on Twitter. They quickly gained traction among social media users and bloggers convinced that several years of protests and demonstrations were engineered by the government in an effort to destabilize society, implement martial law, and enable President Obama to cancel the 2016 election and seize a third term in the Oval Office. The screenshots primarily pertained to the “busing” of paid protesters in to disrupt conventions and Donald Trump rallies, and made no mention of shooting law enforcement agents or creating unrest at Black Lives Matter protests. After the shooting deaths of five Dallas police officers at a peaceful Black Lives Matter protest, the June 2016 claims about Mckesson, Lynch, and a planned “Summer of Chaos” became far more popular on Twitter and other social media platforms. Notably, the tragedy in question bore no resemblance whatsoever to the content of the purported messages; according to the original rumors, Mckesson was the lynchpin of plans to “disrupt … both conventions” and not unleash violence on a protest he supported several thousand miles away from either later event. Imposition of martial law has been a consistent fear among Americans for decades, despite the minute chance it could occur in the United States. In September 1863, President Abraham Lincoln essentially imposed a Congressionally-authorized form of martial law via the suspension of habeas corpus (controversial even then). The Supreme Court heard an appeal for a writ of habeas corpus brought by condemned prisoner Lamdin P. Milligan in 1866, who argued his arrest, trial by military tribunal, conviction, and sentence to death by hanging were unconstitutional. The Court ruled in favor of Milligan, finding that imposition of martial law “destroys every guarantee of the Constitution, and effectually renders the ‘military independent of and superior to the civil power'”; Justice David Davis said that in the opinion of the court, no circumstance warranted “either the President or Congress [to seize] the legal right to impose military justice on civilians outside an actual war zone[.]” . We contacted Mckesson to ask about the rumors and whether the messages were authentic. Mckesson confirmed earlier reports that his account was hacked in June 2016, adding that the messages shared were fabricated by parties unknown after the fact. Given the messages in no way hinted at disruptions to Black Lives Matter protests or violence against police officers prior to the tragedy in Dallas, reference to them as a harbinger of the shootings was moot. In a sense. the claims were similar to “cold readings” done by psychics, in that the claim’s assertions were interpreted as “hits” when in fact the details were entirely off-base. Regardless of their “accuracy,” Mckesson stated that the messages were not authentic. The New York Times. “Proclamation By The President; Martial Law Declared In Kentucky.The Habeas Corpus Suspended. A Proclamation.” 6 July 1864. Miller Center of Public Affairs, University of Virginia. “Ulysses S. Grant: Domestic Affairs.” Accessed 8 July 2016. The Gilder Lehrman Institute Of American History. Accessed 8 July 2016.